A simile is a figure of speech that directly compares two different things. The simile is usually in a phrase that begins with the words "as" or "like." This is different from a metaphor, which is also a comparison but one says something is something else. Hopefully, these simile examples for kids will get them excited about reading and writing. These similes compare using the format "something like something else:"
Did you have any favorites from the similes lists above? Let's pull out a few and see how similes can make our writing more interesting and colorful. During the house fire, my Dad was as brave as a lion. Sunday is cleaning day. By the time we're done, the house is as clean as a whistle. That teacher was as dull as dishwater. I think my grandfather is as old as these hills! This house of cards is as sturdy as an oak. My best friend sings like an angel. After I received that "A" on my spelling test, I thought I might soar like an eagle. Gah! Her voice sounds like nails on a chalkboard! In our eighth grade pageant, we shone like stars. This path meanders like a stream. You can find more information about Figurative Language here on YourDictionary. 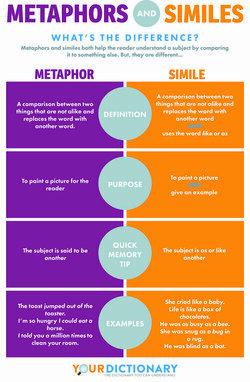 Also, feel free to print the infographic on this page to remind your students of the differences between similes and metaphors. "Simile Examples for Kids." YourDictionary, n.d. Web. 18 April 2019. 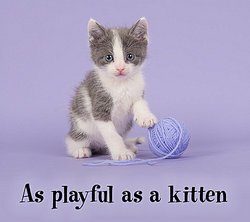 <https://examples.yourdictionary.com/simile-examples-for-kids.html>. A simile is a figure of speech that directly compares two different things. The simile is usually in a phrase that begins with the words "as" or "like." This is different from a metaphor, which is also a comparison but one says something is something else.Hopefully, these simile examples for kids will get them excited about reading and writing.